Hi it's Chris from Autism Classroom News trying to get back on a regular schedule of posting. As the school year gets fully underway, and we all get a bit more stressed, I have written about how to manage stress for teachers. Today I want to talk about how to handle stress of students. Many students on the autism spectrum, and many other students with and without disabilities, often struggle with significant anxiety. Sometimes the anxiety is specific, like being scared of the noise the fire alarm makes. Sometimes the cause or specific fear isn't something the student can identify or name and it just feels like they are crawling out of their skin. These feelings can show up for some kids looking like meltdowns and behavior problems. Activities that may be fine with no problems on most days suddenly spark meltdowns and tears or aggression when the anxiety is high. Anxiety acts as what we call a setting event for behavior problems. It doesn't trigger the behavior, but it makes it more likely that some other event will trigger it that day. It often explains why some students can be perfectly fine in the same situations one day and a mess the next--if their anxiety is high, they can't handle it that day. It is important to remember that anxiety builds up as well over time and little things can contribute to it until it becomes too much to handle. If you think of anxiety like a glass of water, it might start out half-way full. As things happen (work demands, social demands, environmental / sensory demands), water (anxiety) gets added until it overflows. When it overflows, you get a meltdown to something that often seems insignificant, kind of like when you find yourself crying over a broken dish in the kitchen at the end of a long day. Individuals on the autism spectrum have a higher likelihood of struggling with anxiety (and depression) than the general population. Because of their sensory issues and difficulty with communication, they also have a difficult time understanding it, interpreting it and communicating it to others. Consequently we end up having to identify it, predict when it will happen and try to schedule their day in such a way to prevent the glass from overflowing. This is a good start to managing the anxiety, but for the higher functioning students especially, they need to learn coping strategies for identifying and managing it on their own. So today I wanted to talk about how you teach students to identify stressful feelings so that they can start to understand how to reduce them. Then in my next post I'll talk about some tools and strategies you can teach them to help keep the anxiety under control. Disclosure, I have added affiliate links from the Autism Asperger Publishing Company (APPC) for your convenience. One of the best tools I've found for helping individuals identify their stressful feelings is The Incredible 5-Point Scale. 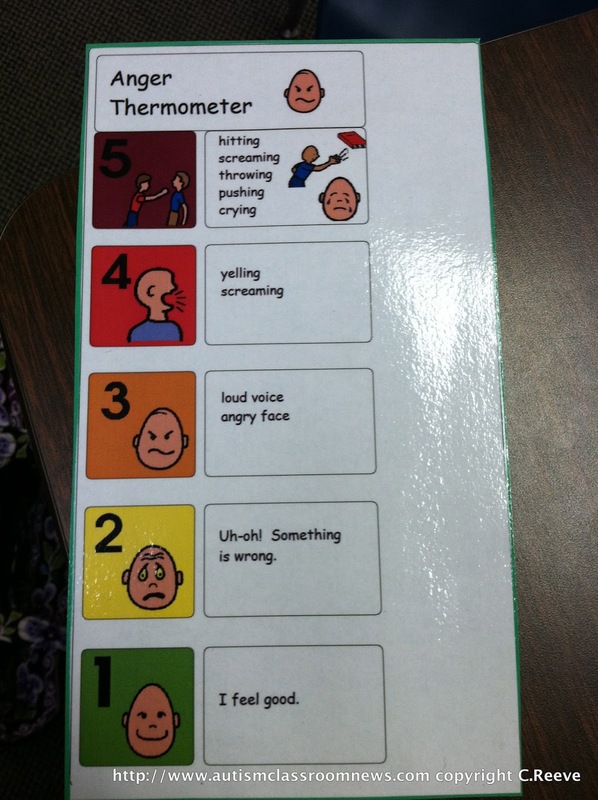 This is a scale developed by Kari Dunn Buron that helps individuals rate a number of things from feelings and anger to voice volume. In the case of anxiety, a 1 would be calm and quiet and a 5 would be out of control. I did a post on Autism Classroom News not long ago on the 5-Point Scale that provides more detailed information about it. The picture on the left is an example of an anger scale. One of the great things about the 5-point scale is that you can link the rating to specific strategies that the individual can do to help bring their number down. This helps them learn to self-monitor over time and manage their own anxiety. First though they have to be able to identify when they feel anxious, so that is where the scale begins. Kari also uses the the Anxiety Curve to help children know when their anxiety is increased--the picture below is from her website. I love the way the teacher's anxiety curve is depicted as rising along with the student's. It's important to recognize that using the 5-point scale is something that has to be taught and students don't learn it just from constructing the scale and being reminded. To help students recognize stressful feelings for what they are, you can use some of these strategies help them identify where they are on the scale or how they are feeling. Interpret stressful behavior for the student when you see that he is showing signs of becoming anxious. (e.g., "There are too many people talking and you feel tense.") If you are using the 5-point scale, you could say, "I see your shoulders are bunching up by your ears, you look like you might be feeling like a 3." This helps the student to identify the feelings he or she is feeling. You can highlight the facial expressions and body language for the individual (their own and others). For instance, "When Tommy tripped and fell, it hurt. He is crying. Sometimes people cry when they are hurt or scared." Or for an older student, "I bet Jim is feeling pretty nervous about his presentation to the class. Look at how he is sweating and fidgeting around!" You could ask peers to do this as well about their feelings to model for the student. You can highlight how you feel by exaggerating your facial expressions and talking about your feelings, anxieties or frustrations. I used to work with a student who would panic and meltdown if he made a mistake. He would erase through the paper, end up tearing up his paper and if he made more mistakes or the paper tore, he would start throwing thing. For him, we modeled when we made a mistake (e.g., "Oops! I messed up. I am so frustrated; I forgot my lunch!" or "Oh no, I spelled this word wrong again on my paper! I will try to stay calm and erase it and try again.") Peers could also do this to help a student see when they are stressed. These are all strategies that are designed to help make recognizing stress more apparent to students who may not pick up on subtle cues. We all have a tendency to minimize our feelings of stress in our society to look cool or strong to others. However, if we want our kids to recognize and manage stress appropriately, they need to see that it's not just them who experience it. You can find examples of the 5-point scale on my Pinterest Autism Behavior Support board where I add new examples I find over time. And below are some books on the 5-Point Scale and how to use it for different ages with lots of examples. 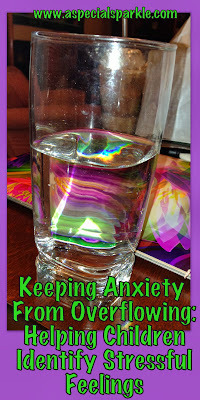 In my next post, I'll talk about tools for helping students to reduce their anxiety. How do you handle anxiety with your students?